Home > four door > Infiniti Four Door GT-R ? Edmunds Inside Line says that Nissan/Infiniti are working on a four door version of the GT-R.
Is a four door , V-8 powered car, built on a similar but stretched chassis a four door GT-R or is it a replacement for the Q45 ? Competitor to the $50k M45 ? They do already produce a M45x all wheel drive starting at around $52k. initially rumored to get a slightly downtuned version of the GT-R's 476-horsepower twin-turbo V6, but one source close to Nissan says the company is now leaning towards a slightly tuned-up version of the 5.0-liter V8 that powers the Infiniti FX50. 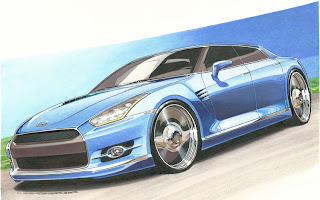 In that guise, the four-door GT-R should develop around 420 hp. The seven-speed automatic gearbox mated to the FX's V8 will almost certainly migrate together with the 5.0-liter engine. The four-door GT-R is expected to weigh around 4,080 pounds and cost in the neighborhood of $100,000. It's slated for a late-2010 debut. GT-R or Q45 replacement ? The thing is this. In the US, people love low revving, high torque engines. The RB is the opposite of that, high revving low torque. Expense and availability also play a part into that. Its easy to find an LS1 nearly anywhere in the US, and have support. The RB is much harder. Harder means more expensive.